Home Uncategorized Who should be the new flower czar? Found this from the Wall Street Journal. LOVE that they quoted our very own Tina Stoecker, AIFD, in the article! Nancy Clarke, the longtime chief florist at the White House, plans to retire May 29, but not before she helps Michelle Obama incorporate her personal style into official floral designs. Flower arranging at the White House has taken a more modern turn since the Obamas moved in, Ms. Clarke says. “They are more youthful…so we gear things a little bit younger. A lot more color, brighter colors, happier colors,” she says. See a timeline of floral arrangements in the White House. In the Obama White House, clear glass cylinder vases hold sparse displays of white orchids or dogwood branches (Mrs. Obama “likes a lot of branches,” Ms. Clarke says), while classic porcelain urns are filled with more structured arrangements. Glass cylinders of hot pink tulips and purple anemones were placed in Sasha’s and Malia’s bedrooms right after the family moved in. Ms. Clarke, 64, says she is retiring to spend more time with her family. Her three-person staff will temporarily run the White House flower shop until the social secretary’s office names her replacement. Fresh flowers, often symbolizing conspicuous consumption, are tricky in times of economic crisis. Ms. Clarke says she has been using long-lasting ferns, grown in a nearby National Park Service greenhouse, in lieu of more expensive arrangements. After a recent luncheon, Ms. Clarke’s staff plucked flowers out of arrangements and put them in a refrigerator until they could be recycled on staffers’ desks. 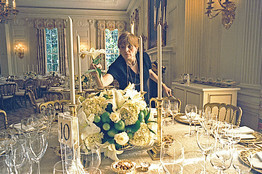 Ms. Clarke works closely with White House decorator Michael Smith to make sure her designs reflect Mrs. Obama’s taste. The day the first family moved into 1600 Pennsylvania Avenue, Ms. Clarke filled the residence with tall, clear cylinders of forsythia, oncidium orchids and cream-colored cymbidium orchids — some of the first lady’s favorites. For 30 years and six administrations, Ms. Clarke has worked in the White House flower shop, a cozy, sunny room around the corner from the kitchen on the ground floor. Starting at the White House as a volunteer in 1978, she now oversees flowers placed throughout the private residence, the Oval Office, public rooms, hallways, workspaces and Air Force One and Camp David, when they’re in use. Last Monday, hours before President Obama joined Mexican Ambassador Arturo Sarukhán at a Cinco de Mayo party on the State Floor, Ms. Clarke put finishing touches on arrangements of three types of hydrangea, sunflowers and curly willow in copper urns. White House Social Secretary Desirée Rogers had approved the arrangements before the event. Nancy Clarke “has created beautiful pieces and has become part of the family of staff that we have here,” Ms. Rogers said in a statement. 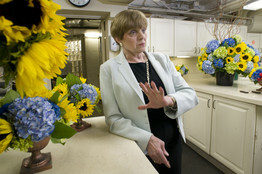 Nancy Clarke has arranged White House flowers for six administrations. 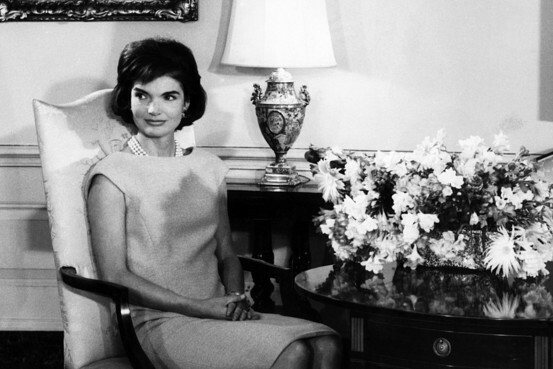 First ladies have used flowers to put their stamp on social functions. 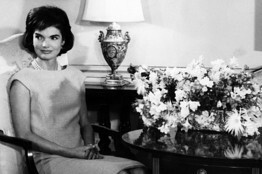 Jacqueline Kennedy liked opulent, French-inspired arrangements and experimented with vegetables. Nancy Reagan had a strong preference for Venus peonies in soft, blush colors, even when they weren’t in season. “I used to say, ‘Mrs. Reagan, peonies bloom in May,'” Ms. Clarke recalls. Barbara Bush, an avid gardener, loved loose, natural-looking arrangements with lavender, bluebells and blue pine. Hillary Clinton had an affinity for tropical flowers, such as birds of paradise and pincushions. Laura Bush had more classic taste and often used the ornate pieces from the White House antique vermeil collection. 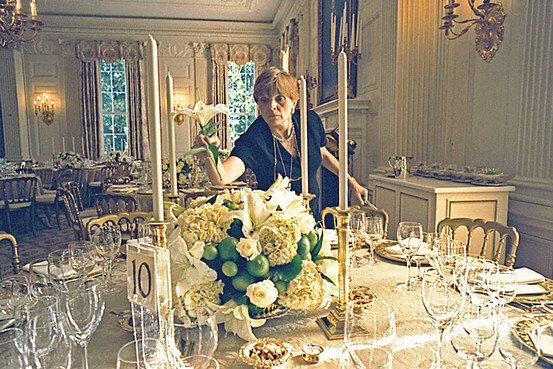 Before a 2001 state dinner, Ms. Clarke put the last touch on a centerpiece of hydrangeas, white lilies, white roses and limes. Some people in flower design worry that too much modernism will detract from the period elegance of the White House. Robert Isabell, the Manhattan florist who did Caroline Kennedy’s wedding, Jacqueline Onassis’s funeral and the White House NATO summit in 1999, says White House flowers should maintain a certain traditional look. “I don’t know if a clear vase or something you’d see in hotels is appropriate for the State Room,” he says. But the Obamas’ edgier tastes are welcome news to others, who say White House flowers could use an update. Tina Stoecker, president-elect of the American Institute of Floral Designers, says she hopes to see more loosely arranged designs, using bright greens and Fuji chrysanthemums, to replace the traditional floral structures. “It’s always been ostentatious masses of flowers,” Ms. Stoecker says. “It’s time to shake things up a bit,” says New York designer David Beahm, who helped with White House events during the Clinton Administration. He envisions bright, symmetrical designs of locally-grown flowers arranged in some of the antique vases in the White House collection. 1830 : Andrew Jackson loved flowers, but back then people believed flowers sucked up oxygen and made the air unhealthy, so artificial wax flowers were used in abundance. 1857 : After a trip to England, James Buchanan‘s niece, Harriet Lane, brought the English style of fresh flowers back to the White House. Ms. Lane became known as the most stylish White House decorator of the 19th century. 1861 : During Abraham Lincoln‘s tenure, blooming camellias and sesanquia grown in the White House orangery sat in tubs of water and decorated hallways and social events. 1869 : Julia Grant disliked the flowers used on the Great Plateau and replaced them with a silver sculpture used as a centerpiece. 1906 : Teddy Roosevelt‘s daughter Alice chose simple jasmine and white orchids to decorate her wedding. 1942 : During World War II, Eleanor Roosevelt did not involve herself much with flower arrangements. Designs during her husband’s administration tended to be simple and understated. 1961 : Jacqueline Kennedy established the Office of the White House Florist with Rusty Young as the first official floral decorator. Mrs. Kennedy did not want flowers to be placed on the mantels because it could harm the priceless paintings and wallpaper she had recently used in her redecorating. She requested her floral staff place arrangements only against the north walls of rooms and on circular tables. She requested flowers with strong fragrances to combat the smell of tobacco since smoking was till common inside the White House. 1965 : Lady Bird Johnson favored wildflowers thrown in straw baskets, and placed them all around the White House. In designing a set of official White House china, Mrs. Johnson chose plates that featured wildflowers from each fifty states. 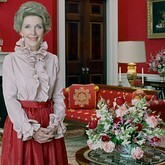 Nancy Reagan in the Red Room on Feb. 17, 1981. 1981 : Former Hollywood hostess Nancy Reagan brought high style to White House flowers. She demanded cream-colored and neutral shades of peonies — even when they weren’t in season. 1990 : Barbara Bush, an avid gardener and horticultural enthusiast, brought “a golden age of flower arranging to the White House,” says historian William Seale. 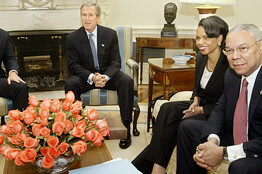 Mrs. Bush preferred natural-looking arrangements in shades of blue and lilac. 1993 : Bill, Hillary and Chelsea Clinton were all allergic to the wreaths that typically decorate the White House in the holiday season. 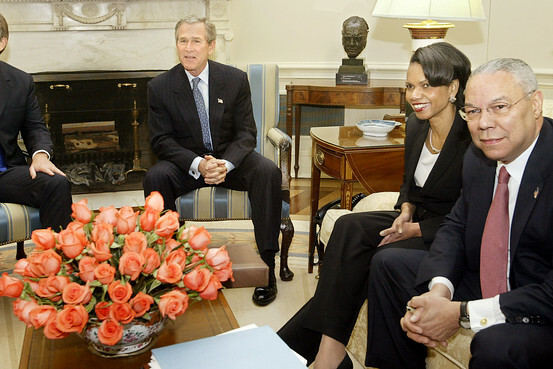 2001 : George W. Bush liked a bowl of peach-colored roses placed on a coffee table in the Oval Office. Laura Bush had classic taste and preferred white roses in the antique vases found in the White House vermeil collection. May 29, 2009 : Chief Floral Designer Nancy Clarke retires after working in the White House Flower Shop for 30 years.